News now in of yet another price reduction as Marco Vandoni at Ocean Independence sends word of a €350,000 price drop on his joint listing with Floating Life, the 30m motor yacht Foie Gras. Built in Holland by Nicholas Witsen and Vis in 1974 and refitted several times, most recently in 2004, this superyacht offers accommodation for six guests in a master suite and two twin cabins. An additional double cabin is possible. 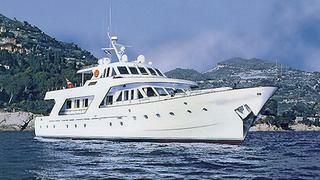 Twin 1350hp MTU engines give Foie Gras a cruising speed of 12.5 knots and her asking price is now down to €900,000.